In numerous Mozilla bug tickets that were recently updated, Mozilla is getting closer to adding cryptomining and fingerprinting blocking to their Firefox browser. In May 2018 it was revealed that Mozilla was planning on blocking cryptominers and fingerprinters starting in Firefox 63. 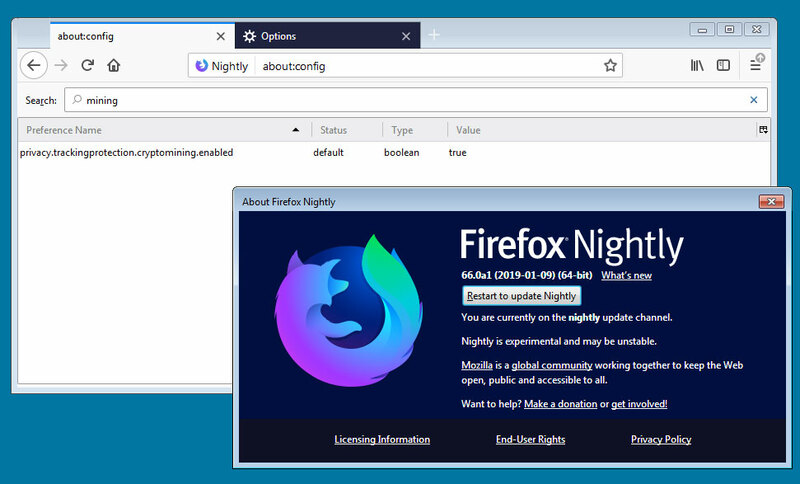 Firefox 63 has come and gone and now Firefox 65 is here, but unfortunately those features were never fully added to the browser. A series of Mozilla bug updates, though, tells us that these features will soon be landing as part of Firefox’s Content Blocking feature in the near future. 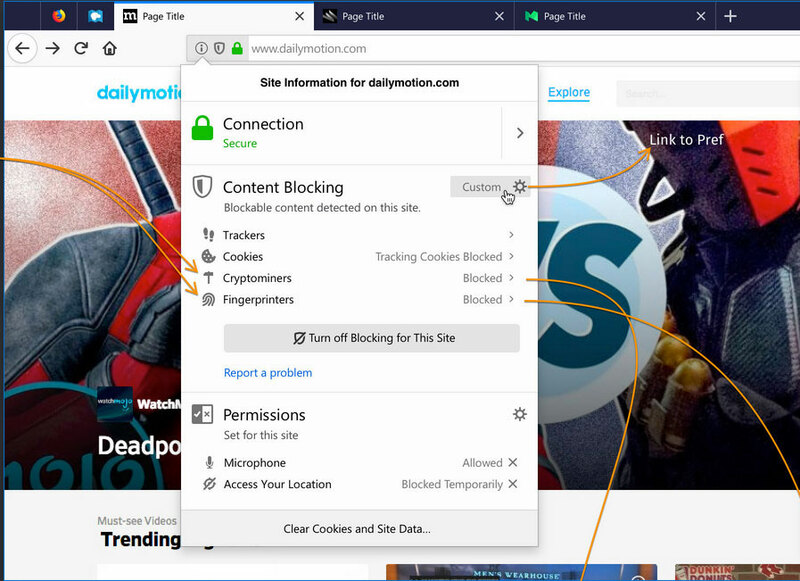 In one of the bug posts, Mozilla has uploaded a mockup of how cryptomining and fingerprinting detection and blocking will be added to Firefox’s Content Blocking privacy feature. 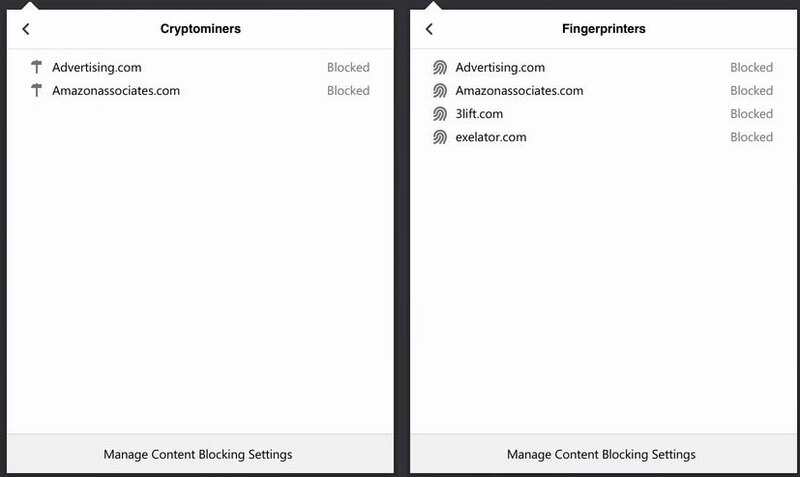 With the initial release, Mozilla will add the ability to block cryptomining and fingerprinting to the Custom settings of the Content Blocking feature as shown below. When these features are enabled, the Cryptominers and Fingerprinters status will be displayed in the Control Center of a site you are visiting. Clicking on either Cryptominers or Fingerprinters in the site’s control center will bring you to their associated subpanels. From here you will be able to see all of the sites currently being detected and whitelist any that you wish. Over time and as these features are further tested, Mozilla plans on moving the cryptomining and fingerprinting options out of Custom and into Strict and finally Standard. 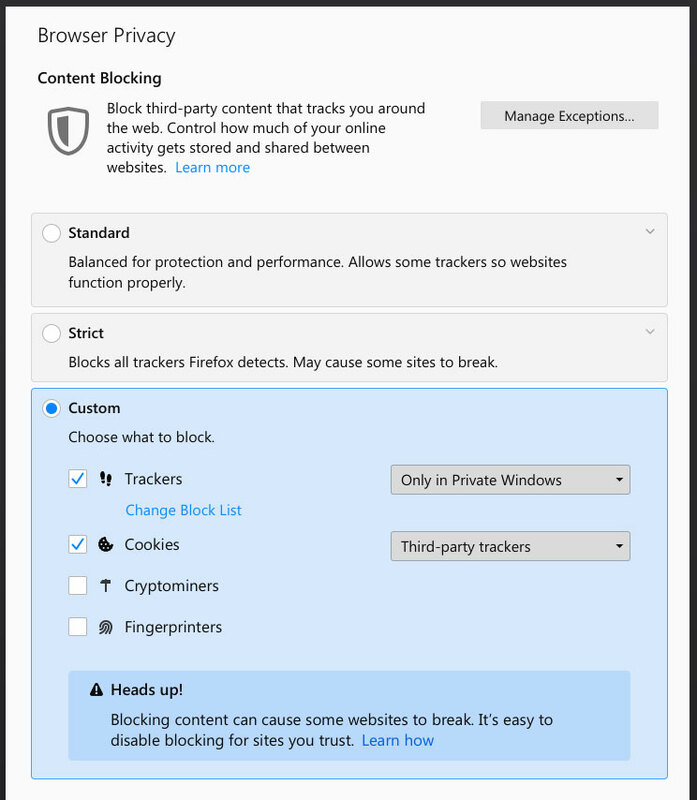 Once in standard, they will be automatically blocked for all users of Firefox. Currently, it is not known when these features will go live in Firefox, but at least part of it has begun to be seen in a Firefox 66.0a1 build as shown by a recent source code revision. This revision shows that two about:config settings named “privacy.trackingprotection.fingerprinting.enabled” and “privacy.trackingprotection.cryptomining.enabled” are available and enabled by default. It is not known, though, if the full GUI changes will be in place for the release of Firefox 66 to stable, so we may see it instead in Firefox 67. These are important features to be added to a browser as in-browsing mining not only steals your energy and increases your bills, but could also damage your CPU by prolonged utilization. We will be keeping an eye on these tickets and will post an update when this feature is more fully fleshed out.